Donna High School senior Eric Garcia wants to go to medical school and become a neurosurgeon. To get on the right track, Garcia began taking college courses last year at South Texas College (STC) in fields related to Science, Technology, Engineering and Mathematics (STEM). While enrolled in STC’s Dual Enrollment Academy, Garcia noticed that only three Donna ISD students were in the program. He was concerned and knew he had to do something to increase DISD representation. So, to do his part, Garcia joined the DHS Ambassador Program. He serves as president this year and works with 32 other members. 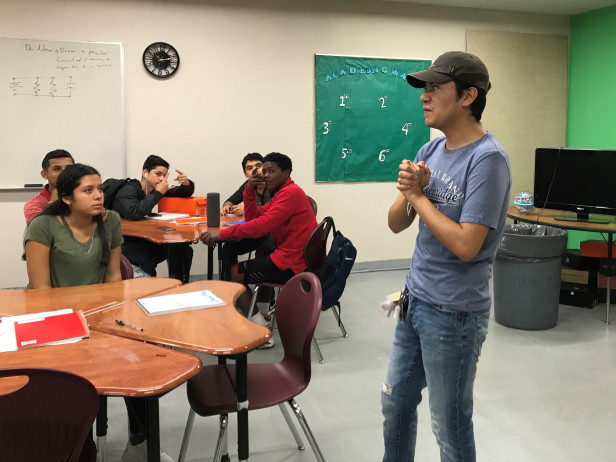 They are juniors and seniors whose primary role is to help freshmen transition from middle school to high school and educate them on the resources made available to them. Garcia saw this initiative as a perfect opportunity to explain the Dual Enrollment Academy and the benefits it offers. As part of the program, the ambassadors go over PowerPoint presentations in freshmen classes that explain the roles of the campus departments and what opportunities and programs are available to them. Garcia said many of the students he shares information with are interested in engineering, an area he is not familiar with since he is pursuing a biology major in college. Nevertheless, he still helps them as much as he can.